We very much enjoy creating useful and beautiful products from local natural materials inspired by the amazing nature all around us here in The Scottish Highlands. Our favourite material to work with is wood – from seed and throughout its life to ash and decay. We also make unique driftwood pieces from stone and driftwood. We try to keep the original beauty of the natural material, which shows its unique history. We craft from local natural materials, personalised hand burnt key rings, wooden buttons, and coasters. Driftwood trees (for Christmas or all year), Tree Charm decorations with many unique designs, natural wooden hooks made from tree branches, and we will hopefully be adding some photography based items soon too. We choose, cut, shape, sand, wax and drill each button, keyring and coaster by hand. Being a natural wood product each piece is unique. Our buttons are presented on either a hessian, linen or 100% wool tartan backing with a whittled stick and string to hang. As well as looking very decorative, we find that it is very useful to be able to hang the buttons in your craft space where you will be able to find them when needed. It is then up to you to finish the story, whether they become a fastening on a handmade cardigan, a new embellishment for a favourite cushion, bag, quilt or curtain, or they would make a lovely gift to anyone who enjoys crafting. The backing could also be re-used, maybe to hang earrings or even more buttons? We have now renovated a long-term empty house into a comfortable welcoming home. We have 2 kingsize guest bedrooms one with adjoining private shower-room. We offer bed and continental breakfast holiday accommodation in our working, crafting home. We only take one party at a time and can accommodate up to 4 people very comfortably. 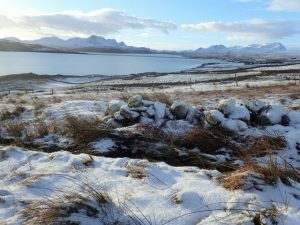 We are lucky enough to have views of the often snow capped mountains, the sea, seals and very occasionally dolphins and eagles from the windows. 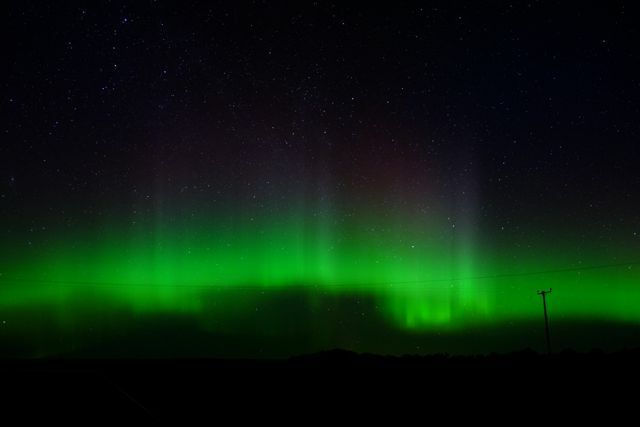 We also have, when conditions are right, the most amazing views of the Northern lights, Aurora Borealis. Aurora Borealis as seen from the bedroom window.